Happy Friday! I am pumped and just SO ready for the weekend. It's been a long week and I'm looking forward to a slower pace (even if it is filled with staff meetings!) next week. Also, how is it that it's the 12th of December already? This is CRAZY people, just crazy. But here's to the weekend, to Christmas, and to lovely links! I've always wanted to make ornaments like this. And I've always wanted to make these, too. Love this DIY scarf idea. As a visual person, this street sign is just plain awesome. This sounds like the perfect Christmas gift to DIY. 3 steps to a healthy closet. Because "being blessed doesn't necessarily mean living a comfortable life." I'm all about rustic design right now. And 15 holiday DIY projects. This is my kind of wedding. I've decided I'd love a dress like this one. Mmm gonna need those hashbrowns, stat. I'm definitely intrigued by those citrus ornaments!! When I lived in Portland my car got towed 3 times because of confusing parking signs... no joke. I'm happy to say only one of those was my fault... but I got a couple tickets too. :) Whoopsie! That backyard wedding is amazing!! So beautiful! Same! Aren't they pretty? I saw them and knew I had to make my own. I haven't yet, but someday I hope to! And that's terrible to hear about your towing in Portland! Parking there is CRAZY, though! :) Hooray that it wasn't your fault each time, though! Loose the rustic design right now! Is that your mantle up there? I love it!! Yes, it is! Christmas is my favorite time to decorate because we get to pull out a bunch of nativity scenes from around the world. 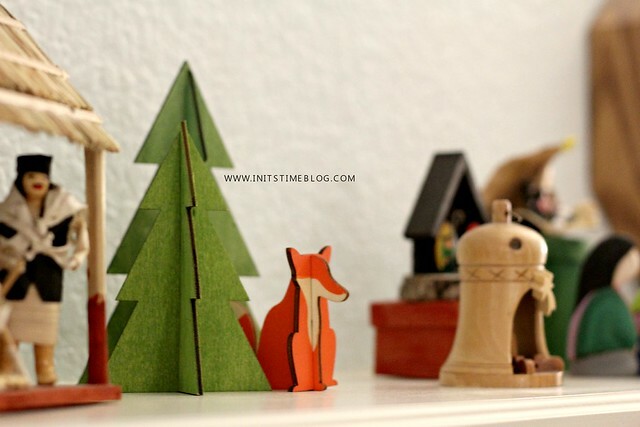 Well, that and some cute wooden trees + foxes, too! It was a good read, right? Definitely needed that one, too. Hope you're having a great week!